They call 2013 the Year of the Comets. When you can have 3 naked eyes comets gracing the sky in a year, 2013 definitely deserves the title. The first one is called Comet PANSTARRS. PANSTARRS, stands for Panoramic Survey Telescope & Rapid Response System, is the telescope that discovered the comet. This 1.8-m telescope is located atop the Haleakala volcano in Hawaii. This comet already put on a great show in the southern hemisphere, and now our fellow Malaysians also had captured the comet in Negeri Sembilan and Sawarak. It was estimated that the comet is the brightest between March 8 – 12, with roughly the magnitude of zero. But bear in mind that a comet’s magnitude is the estimate of the light emitted by the whole (extended) object, while a star is a point of light. Thus, when Comet PANSTARRS reaches a magnitude of zero, it won’t appear as bright as a zero magnitude star because the comet’s light will spread out over a larger area. The video below shows the position of the comet for Kuala Lumpur, Malaysia from 8 to 30 March. The chart was produced using Stellarium. If you do not have Stellarium, go and download one now! It’s an open source planetarium software that can show you how the sky looks like anywhere on Earth. And since Comet PANSTARRS is the hot topic now, you wouldn’t want to miss it. So, once you have installed Stellarium, follow this video to add Comet PANSTARRS (and other comets). Now you can know when and where the comet is visible at your location. To observe the comet, you need a clear and unobstructed western horizon, it only visible for 1 hour after sunset. Be early at the observing site, you can enjoy the beautiful sunset while searching for the comet. If the sky is clear, we should be able to see it with the naked eyes, if you have binoculars would be better. The second one is called Comet Lemmon. The comet was discovered by A. R. Gibbs using the telescope at the Mount Lemmon Survey, located in Catalina Mountains north of Tucson, Arizona, USA. 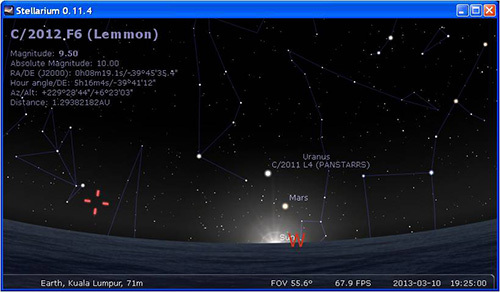 Comet Lemmon is actually located quite near to Comet PANSTARRS, but the sighting favours those in the southern hemisphere. If you are lucky to have a clear sky, you can capture both the comets in one picture, as shown in the beautiful picture below. You can also notice the different colours of the comets: Comet PANSTARRS (near the horizon) is showing its dust tail reflected by sunlight, whereas Comet Lemmon is sporting a green tail dominated by glowing ions. The charts below show the positions of Comet Lemmon and Comet PANSTARRS for Mar 10 and 15 in Kuala Lumpur, Malaysia (use the same method as above to add Comet Lemmon into Stellarium). 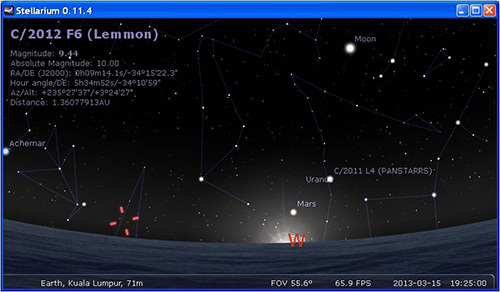 For us at the equator, Comet Lemmon lies near to the horizon and poses a challenge to spot it. Hopefully, we also can capture a picture of dual comets like the one above. The final comet is Comet ISON, which hopefully will put on a great show in November. At its brightest, it is predicted to be brighter than the full moon! We will just have to wait and see. I’ll write more on it when the time is near. So, for this whole week, do not do overtime, go out before sunset and try to catch some comets! This is a picture I took last month in Northern Thailand. It was a sky full of stars, with the Milky Way band at the bottom. If you pay some attention, you can see an elongated fuzzy blob right of centre, among the trees (click for bigger version). And if you familiar with the sky, you will know that is Andromeda Galaxy. Andromeda Galaxy or M31 is about 2.4 million light-year from us – our neighbour in cosmic scale. It is the closest big spiral galaxy like our own Milky Way and is easily visible to the naked eyes on a clear night. Now, imagine how this big and near naked eye galaxy will look like using the Hubble Space Telescope (HST). Individual star clusters in the galaxy can be seen. And you can help to find them. Join the newly launched Andromeda Project. This project is asking anyone who is interested to help examine thousands of HST images of Andromeda Galaxy and identify its star clusters. Star clusters are groups of hundreds to millions of stars that formed from gas at the same time so all the stars have the same age. Star clusters are important because it hold clues to the evolution of galaxies. We are all curious how galaxies like our own Milky Way form, and Andromeda is the best place to study that process since our position within our galaxy makes it hard to study our history. So far, scientists had looked through part of HST images and just manage to find 600 star clusters. It is believe that the full set of images contains 2500 star clusters. It is too time-consuming for a few scientists to look through such a big set of data, and the pattern-recognition software is not really that helpful. 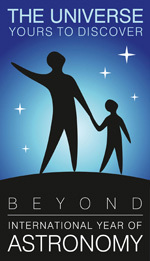 So, instead of drowning the scientists with all these data, public were asked to help explore this galaxy next door. Registration is not required and a simple online tutorial teaches you how to recognise and mark the star clusters. Just go to the website – Andromeda Project – and get started. I strongly agree with Cliff Johnson, a University of Washington graduate student working on the project: “You don’t need to know anything about astronomy to participate, and it’s actually pretty fun, like playing an online game”. So, if you are free, why not spend some time doing some real science? 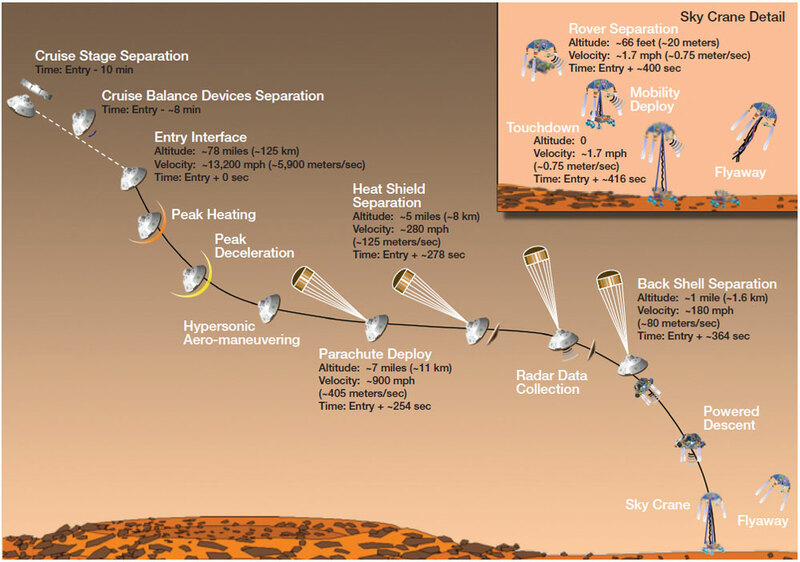 Eight months ago, NASA launched Curiosity (Mars Science Laboratory, MSL) on a 560 million km journey to Mars, and in less than 2 days’ time, Curiosity will touchdown on Mars, on August 6, 1:31 pm Malaysia Time (5:31 am UTC). This 950-kg rover is beyond anything we ever sent to another world – it is the heaviest laboratory and the suite of mechanical systems and scientific instruments are the most sophisticated we ever put on the Red Planet. 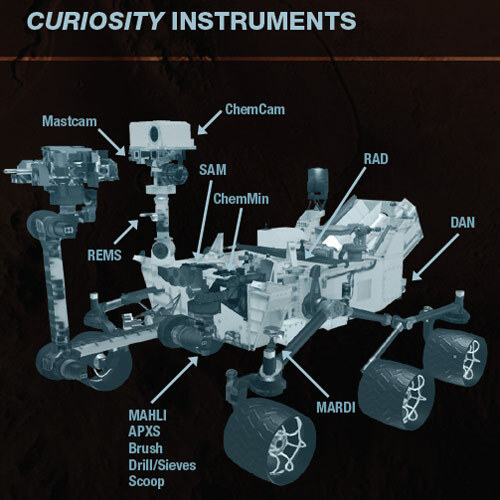 Its primary science goal is to explore Mars as a potential habitat for life, either past or present. If you wish to follow the landing live, you can watch NASA TV, or join a group of astronomers and enthusiasts at Google+ Hangout. You can find more info at Universe Today or their Facebook events page. Before Curiosity can explore Mars, she will have to land safely. And since she is too heavy to use airbag, as the previous rovers did, engineers had to design a unique landing system to deliver her safely on the ground. It includes a sequence of steps that we could not control or even witness in real time because signals take 14 min to reach Earth from Mars. All will be done by the onboard computer. This 7-minute of terror from Mars atmospheric entry to touchdown include a heat shield, a huge parachute, retro-rockets and a sky crane to slow her from over 13,000 MPH to 0 MPH. Hundreds of things have to go just right. The two videos below by JPL nicely summarised the whole process (make sure you watch both of them!). 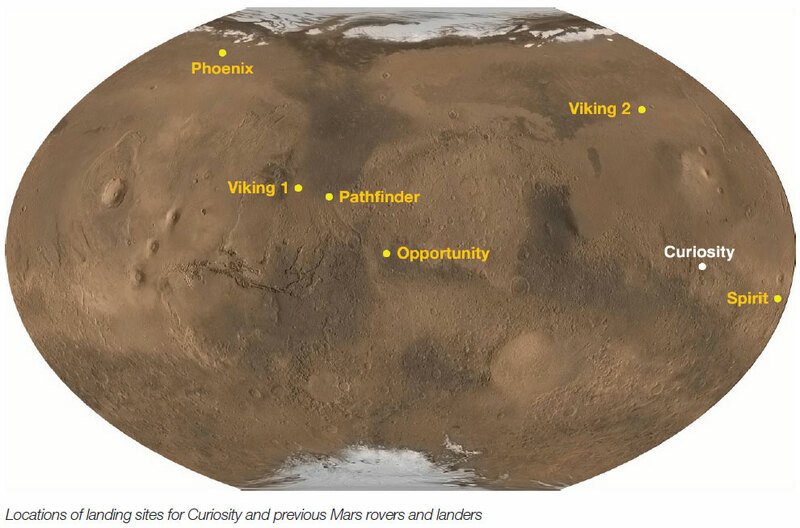 Curiosity will land on the floor of Gale Crater, 5 degrees south of the Martian equator. 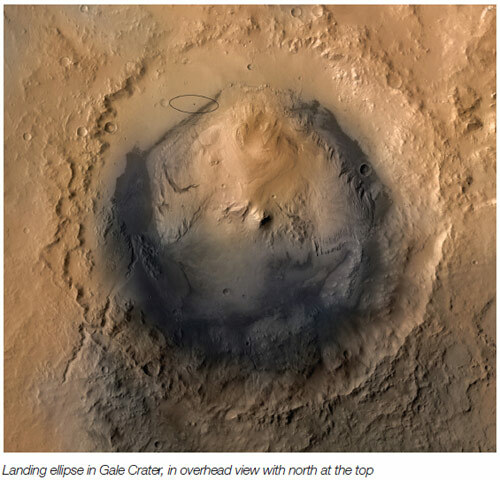 Gale Crater is an ancient asteroid impact about 154 km wide. Gale Crater is a fascinating place to explore because of the mountain of layered materials in the middle. Studies from orbit have revealed that the layers have different minerals depending on their height. These different layers represent different environmental histories of Mars. The layers tell a story about what Mars was like in the past, perhaps spanning much of the early history of the Red Planet. 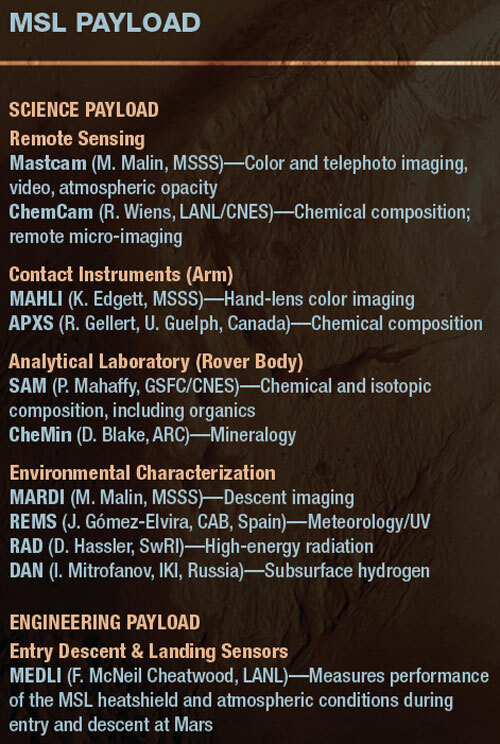 Curiosity carries a variety of science payloads to conduct a comprehensive search for signs of life, which includes remote sensing, contact instruments, analytical laboratory and environmental characterisation. 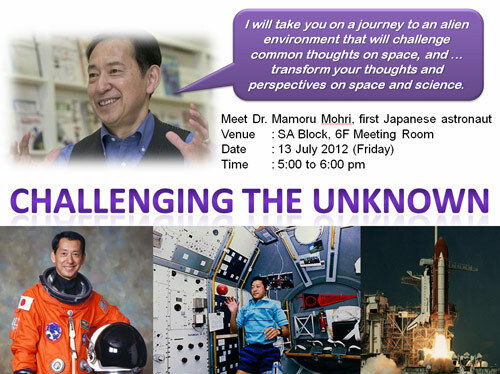 Last Friday (Jul 13), our university (UTAR) hosted a talk by the first Japanese astronaut, Dr Mamoru Mohri. A veteran of two space flights, Dr. Mohri has logged over 459 hours in space. He flew aboard Space Shuttle Endeavour as a payload specialist on STS-47 in 1992, and as a mission specialist on STS-99 in 2000. The talk lasted slightly over an hour, it was very interesting and I learned a thing or two. 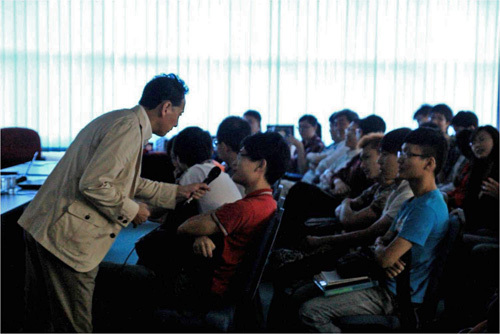 He started the talk by telling how he got interested to become an astronaut. He was inspired by Yuri Gagarin, the first human in space, that he asked his brother to take a picture of him with Gagarin in the television. In 1963, a total solar eclipse swept through his hometown, strengthen his interest in space. However, he had to put his dream as an astronaut aside because during that time only a Russian or an American can be an astronaut, and he was none of both. His dream became a reality when, at the age of 35 (if I remember that correctly), Japan was seeking for candidates to be an astronaut. He succeeded to become the 7 finalists sent to NASA for training. He then showed us some videos of Earth taking from space, telling us his experiences how the Earth look like through his naked eyes. It was not the same as what they looked like in pictures. He also showed the videos of him running experiments in space: blowing bubbles in water sphere, examining the properties of water (surface tension and wettability), colliding water sphere with metal sphere. The most interesting part of the talk is that before he showed us the outcome of the experiments, he’ll walk around and asked the audiences what result they expected, forcing everyone’s brain into high gear. One of the most simple and yet very interesting experiment was investigating how our body changes in space. On the ground, Dr Mohri measured the size of his neck and thigh. So when he was in space, what do you think will happen to the size of the neck and thigh? Getting bigger or smaller? Frankly speaking, I didn’t get the right answer. My first instinct was it should get bigger, since in space the pressure is lower. However, I also know that the cabin will be pressurised to atmospheric pressure, if not, how were the astronauts going to live there? So my answer was there should be no changes, but my guts told me that it was not right. So it turned out that my guts were right, there were some changes. The neck will get bigger while the thigh will get smaller. Why? Because our body is mainly made up of fluids. On Earth, gravity pulls the fluids to the lower part of the body, making the neck smaller and thigh bigger; in space, since there is no preferred direction, the fluids in our body will distribute evenly. Thus, in space, the neck will be slightly bigger and the thigh will be smaller. 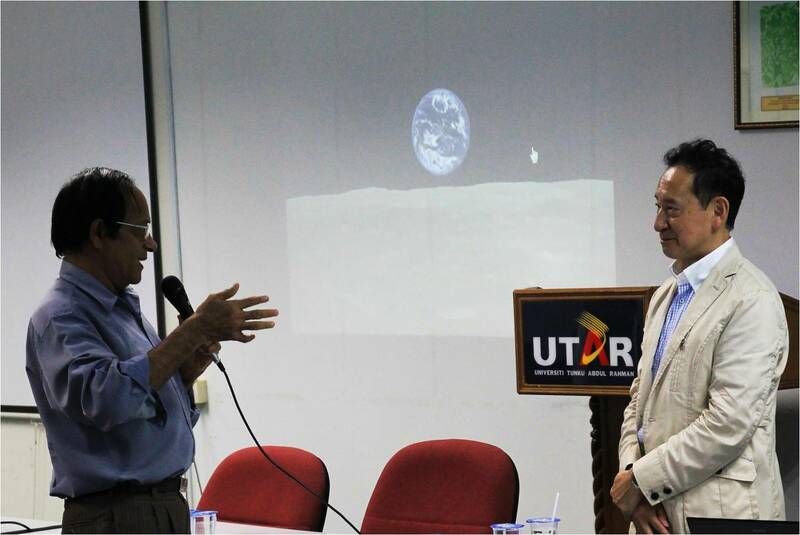 He wrapped up his talk by, again, taking us around the Earth as viewed from space, and finally Earthrise from the Moon taken by a Japanese spacecraft, Kaguya. 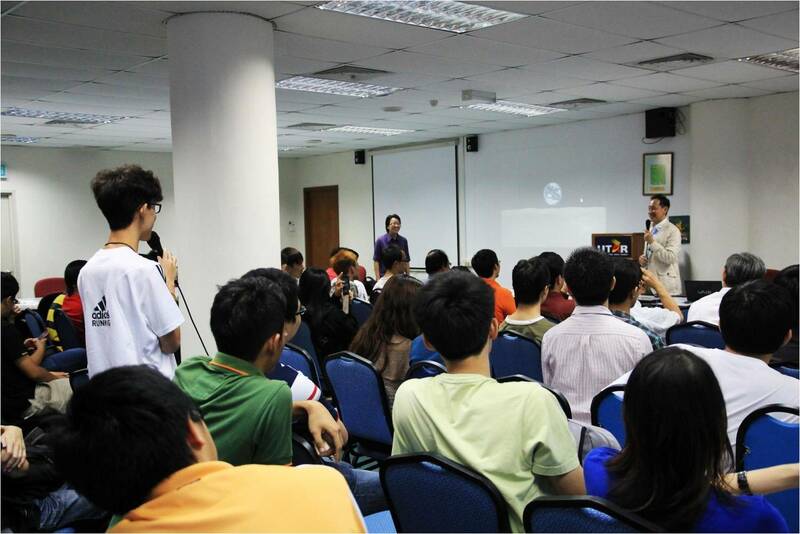 All in all, it was a great talk, and I think everyone enjoy themselves a lot. Lastly, I can’t help not to mention that I was honoured to be the emcee of the event, introducing Dr Mohri to the audience and reading his biodata. This is not something that you are given the opportunity to do every day! 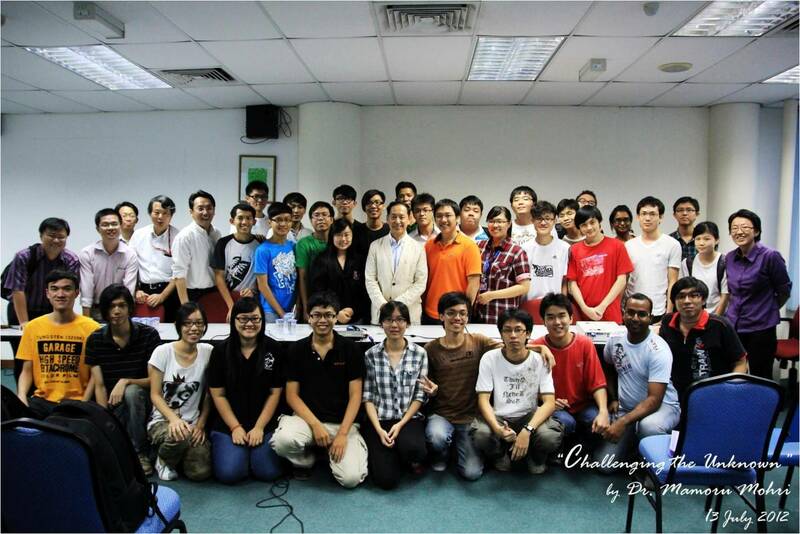 All photos courtesy of Lee Choon Kuan. You won’t want to miss this event on Jun 6 (Wednesday). This is an event which only happens about twice in a century and won’t happen again until the year 2117! The event is known as The Transit of Venus. Transit of Venus happens when the planet Venus passes directly between the Earth and the Sun, and from Earth, we can see Venus as a small black disk moving across the face of the Sun. A Venus (or Mercury) transit is actually similar to a solar eclipse; in a solar eclipse, the Moon passes directly between the Earth and the Sun, and since the apparent size of the Moon is almost the same as the Sun as view from Earth, the Moon will block out the whole Sun. Venus (or Mercury) although is much bigger than the Moon, it is also very much further away, thus Venus will appear much smaller and is unable to cover the whole Sun. Instead, it will appear as a small black disk against the Sun big bright disk, and moves slowly across the Sun’s face which can last for hours. Transit of Venus occurs in pairs of 8 years apart separated by 105.5 years and 121.5 years. The last was 8 years ago in 2004, the next one is this coming Jun 5/6, and if you miss this one, I don’t think you will see this event again – the next one will be 105.5 years later in Dec 2117. In Peninsular Malaysia, the Sun rises around 7 am, so we will miss Contact I and II. 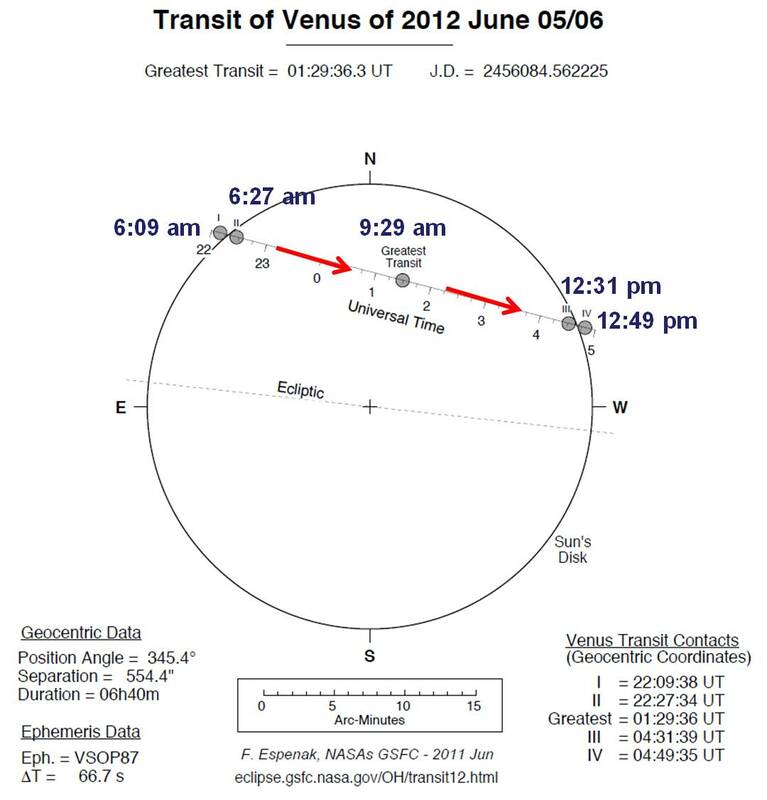 Venus is already transiting the solar disk when the Sun rises. However, we can observe the event until it ends at 12:49 pm. 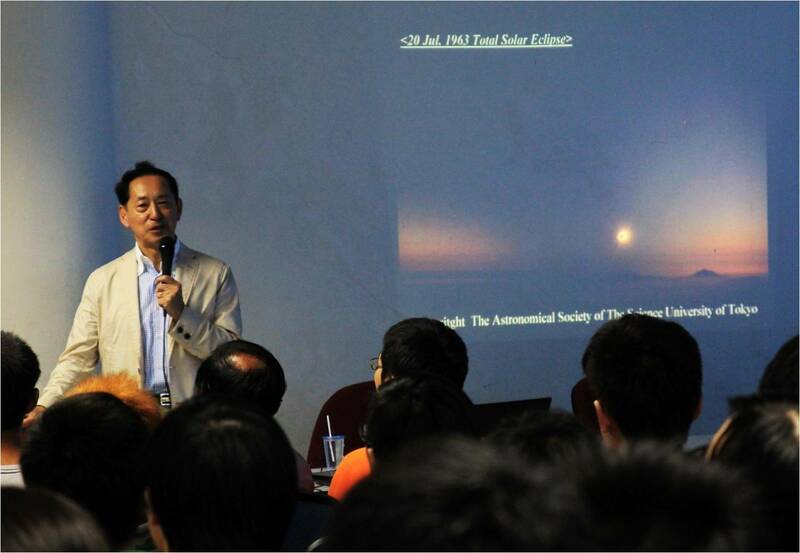 Sabah and Sarawak will have a better chance to see Contact I and II as the Sun rises, although you may need a clear and unobstructed horizon to see sunrise. In Sabah, sunrise time for Sandakan is roughly 5:50 am, Kota Kinabalu 6 am. In Sarawak, sunrise time for Miri is roughly 6:12 am, Kuching 6:30 am. For sunrise time in your town, just type “town-name sunrise time” into Google. My initial plan for this post is to include everything on Venus Transit, from its history to how to observe. But now I decided to give up the plan for two reasons: (1) I’m running out of time to write, (2) a lot of people had done a better job than me in explaining all the details, so I think I’ll direct you to the links for all the interesting details. These two weeks are very eventful for astronomy enthusiasts. First, we have an annular solar eclipse on May 21 (pictures on this later), tomorrow we are going to have a partial lunar eclipse, and on Jun 6 we are going to have a rare Venus transit (more on this later). 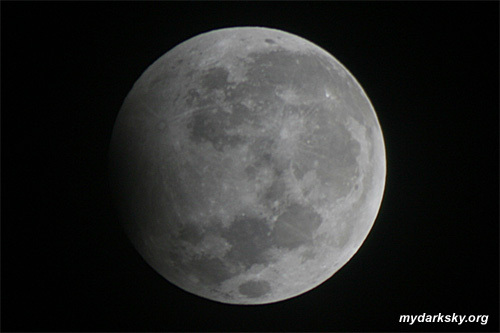 In Malaysia, the partial lunar eclipse starts before the sun sets, at 4:48 pm, when the Moon enters the Earth’s penumbra shadow. At 6 pm, the Moon will enter the umbra, and greatest eclipse will occur at 7:03 pm with 37% of the Moon in Earth’s umbra shadow. Unfortunately, we are going to miss all these in Malaysia because the Moon only rises around 7:20 pm. However, we will still be able to observe the end of the eclipse as the Moon leaves the umbra between 7:20 and 8:06 pm. The eclipse can be observed with or without a telescope. Telescopic view definitely will be better, but if you do not have a telescope, you can also observe just using your naked eyes. Hopefully the weather is clear for us to catch a glimpse of the eclipse. If you miss this eclipse, it’s OK, you can wait for the next one; lunar eclipse occurs few times a year. But make sure you do not miss the Venus transit this coming Jun 6 (details later), the next one will be in year 2117!